The current Worldcon kerfuffle may seem to some like a recent phenomenon based on the flaming currents of social media. However, such controversy has existed throughout the history of fandom. In fact, going back to the the very first Worldcon convention, prevalent members of science fiction were excluded based on their political beliefs. Sound familiar? So with a desire to gain a better historical perspective, I called David Bischoff. 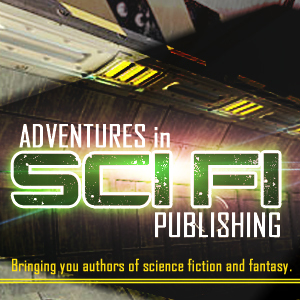 I write science fiction with Dave, and he’s really the man to speak with regarding the history of SF&F fandom. Not only does Dave have a 40 year (and counting) history writing genre fiction, but he has extensive experience going to SF cons long past and getting into a heated debate or two…er, hundred. The following is a transcript of our discussion: Enjoy! Saul – What’s your thoughts on the Worldcon controversy involving Vox Day and the Sad Puppies? David Bischoff – Well I just heard about all this hullabaloo when my esteemed colleague Jerry Oltion started posting notices on our local writer’s group page. I’m still puzzled about this whole thing about Sad Puppies and Rabid Puppies, I didn’t know it was about Libertarianism. I just thought it was about people looking to push their own sad self published books. I don’t really know how a political philosophy pertains. Frankly as far as that goes, this seems to more the kind of thing that L. Ron Hubbard’s creeps do. But then Ron was an SF fan and writer who lived in a slan shack in the early 40s, so the tradition goes way back. Saul – Is this really on par with Hubbard? David – What I know is this. Why are people taking this so seriously? I think it’s a hoot and great publicity for SF and Worldcon. — Vox Day is a genius! David – He’s done what John W. Campbell used to do which is have fun being a Devil’s Advocate and poking sharp sticks of pseudo-reason at the dopey heart bleeding liberals. Saul – I don’t know, it seems to be more than just having fun. Anyway, where do you place yourself on the scales of reason? David – Me? I’m a rational and perfect Super-Liberal who has voted Democrat all his life, but actually would prefer to hang with conservatives who are lots more fun. Did you hear about the gorgeous Wonder Twins and their books? Now I’d collaborate with them in a heartbeat. Oops! Maybe I better read one of these gems first. Saul – Do you think Libertarian SF is making a strong comeback? David – How the hell am I supposed to know? I don’t see sales figures. I do know that some of the looniest people I ever met were Libertarians. I went to the 1981 Denver Worldcon which was just winding down a Libertarian Conference and lots of the nutters were staying on to the Worldcon. I remember all these weird people talking intensely to each other about their various personal theories. The talk of the early Worldcon was how one Libertarian had gotten so overexcited in a discussion or argument that he’d keeled over with a heart attack and died on the spot. Saul – Sheesh, that’s horrible. David – Frankly, I think that science fiction people INVENTED Libertarianism. Prominent amongst these was Robert A. Heinlein, who actually had a strong medical excuse. Saul – Now that’s interesting. Did you know Heinlein? What was your impression of him? Well I met him all the time in SF. Personally I was lucky enough to not only meet him in personally not long before he died, but to witness him in remarkable action at an SF con in the mid 70s when he was guest of honor. Saul – How did that go? David – His stint at the Worldcon was wild. First, he had this blood drive. Awesome. On the other hand, did the blood bankers really want blood so filled with booze and drugs? Then he demanded that if you wanted a book signed by him, you needed to show proof you’d given at least a pint of blood that weekend. Saul – Sounds pretty driven for a good cause. He proceeded to ramble on about wonky political stuff, often incoherently, for the full 39 minutes. Saul – Then what happened? David – People started booing. David – I for one was happy the speech was only a half hour. Now mind you, I’m a big fan of everything the man wrote before TIME ENOUGH FOR LOVE. I once had an argument about this with Charles N. Brown, the remarkable founder of LOCUS, but I know people who agree with me. Nonetheless, I still read and reread his earlier stuff and it was and still is great. The man was not only a modern visionary, he wrote like a dream and really could draw a reader into a book. Just recently I reread THE DOOR INTO SUMMER . Hey. Any books up for the Hugo this year as good as DOOR INTO SUMMER. Rabid Poopies? Sad Poopies? Hey that’s the title of your next book Vox Day. David – Anyway, I got to meet him another time because a woman I was dating once and a while at the time knew him and his wife Virginia. I lived in Maryland at the time. Heinlein was a graduate of the Naval Academy at Annapolis, Maryland and was attending a reunion there. Heinlein invited my friend to a party and she took me along as a date. My friend and collaborator Charles Sheffield was also there, so I was relieved about that. Saul – So what happened at the party? David – It was a wonderful party. Heinlein was so gracious. I think I heard later that he’d had some kind of operation that improved his mental facilities. You know, when you look back you can see there are plenty of SF fans and authors who were low grade autistic. Not Robert Anton Heinlein. When he came over to chat with my friend and I shook his hand, and I asked him how his reunion was. He said it was wonderful. We talked a little more and he called Charles over and also a Japanese rocket scientist from NASA who both Charles and I knew and who was one of the biggest Heinlein fans in the world. We talked a bit more and then Heinlein excused himself. I was ready to give blood. David – He winked at me. “Just a minute.” He went off into the bedroom of the suite. When he returned he had a copy of one of my books. And he even had a pen. I find tears in my eyes now even as I think about that. You know what? Robert A. Heinlein won some Hugos and he cherished them. I don’t think he needed any help in getting on the Hugo ballot, ever. 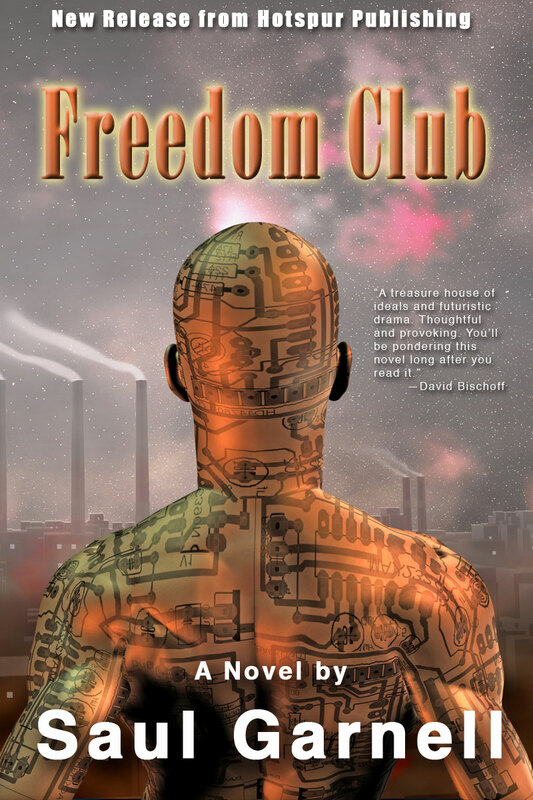 Well, my first Kindle novel Freedom Club has finally been launched as of early October. Many thanks to the entire staff of Hotspur Publishing. Everyone worked very hard to get this first release ready. Also, notice the final cover design. Isn’t it great? I am thankful to everyone who voted on the two versions that were posted last month. Clearly, the one named simply, transistor man, was a clear favorite by a margin of 3 to 1.